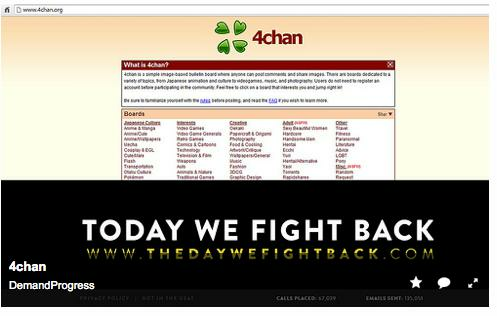 The website 4chan.org displays a banner advertisement promoting Tuesday's surveillance protest The Day We Fight Back. Participants in the protest made 96,000 calls to Congress, although 7,000 of those calls weren't delivered because lawmakers turned voice mail services off, organizers said. Organizers will deliver 555,000 email messages protesting the NSA surveillance to lawmakers, with emails going to the two U.S. senators and one representative who represent each of the 185,000 people who signed up for the email blasts. Another 245,000 people signed a petition calling for the end to mass surveillance, and participating websites showed a protest banner ad 37 million times during the day, with about two-thirds of those ads delivered in the U.S., organizers said. David Segal, executive director of Demand Progress, called the protest a big success. Organizers will continue to push for changes in NSA surveillance, he said. "A hundred thousand or so calls to Congress, on a single issue, in just over 24 hours, is the sort of mark that's met perhaps a handful of times a year, if that," he said by email. "On Tuesday we sought to make a dent, while laying a foundation for escalation. We will persist, we will escalate, and we will win." Participants in The Day We Fight Back also tweeted the website address 84,000 times, not including thousands of other tweets related to NSA surveillance, and they shared information about the campaign 420,000 times on Facebook, said organizers, including digital rights activist group Demand Progress. Many of the organizations support the USA Freedom Act, a bill in Congress that would rein in the NSA's bulk collection of U.S. telephone records. More than 6,000 websites participated in the protest, organizers said. Among the groups involved were the Electronic Frontier Foundation, the American Civil Liberties Union, Google, Twitter, Tumblr, Mozilla and Reddit. An NSA spokeswoman declined to comment on the protest.